Lifehacker featured a how-to guide on their blog. Not much new info but a nice solid guide for terra-newbies. However I disagree on the touted ease of moss-growing. 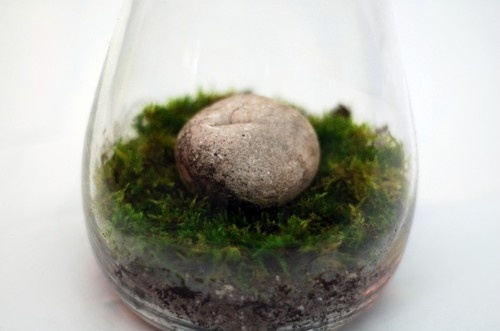 Maintenance: Once you have your substrate and moss in the container the only thing left to do is keep the moss moist. That's it. As long as the moss isn't in harsh sunlight or left to dry out you'll have great difficult killing it off. This one looks the easiest. Moss and a rock. Hmm... I am getting closer to my first attempt to make a terrarium. I have a container, moss, ferns. Need to check if the soil which I have is OK. I'll use your blog as a manual if you don't mind. What am I doing wrong? I use a mix of potting soil; chopped sphagnum, charcoal... topped with sphagnum peat moss and coconut husk chips. Anon - maybe try mixing some sulfur fertilizer into your moss substrate next time? Many mosses prefer acidic soil.